Delivery or light truck drivers typically earn over $16 per hour. If you want to work part-time as a truck driver, you must decide which type of truck you want to drive. Heavy truck or tractor-trailer drivers transport foods and products via interstate highways. Light truck drivers deliver merchandise to local stores, or transport packages to residences and businesses. Some even have selling responsibilities. As a part-time truck driver, you may relieve full-time drivers who take vacations. Companies such as UPS and Federal Express may start you part-time until a full-time position becomes available. You can expect average hourly wages of $16 to $20 for both types of trucking jobs. 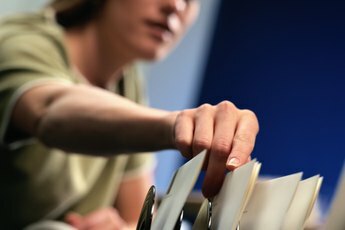 Part-time employees are defined as those who work less than 34 hours per week, according to USLegal.com. Heavy truck drivers earned $19.40 per hour as of May 2012, according to the U.S. Bureau of Labor Statistics. If you worked 10 to 19 hours as a part-time heavy truck driver, you'd earn between $10,088 to $19,167 per year. Working 20 to 34 hours per week, you would gross $20,176 to $34,299 annually. The BLS reported light truck drivers' earnings at $16.32 per hour. Therefore, you'd earn $8,486 to $16,124 per year if you worked 10 to 19 hours per week, and $16,972 to $28,853 working 20 to 34 hours. In 2012, heavy truck drivers earned some of the highest hourly wages of $27.29 making deliveries for the aerospace products and parts industry, according to the BLS. 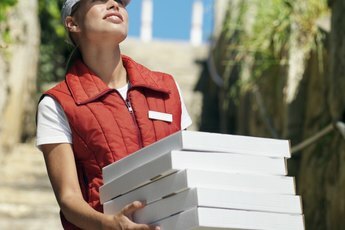 They made $21.35 per hour delivering to grocery stores across state lines. If you worked at least 20 hours per week as a heavy truck driver, you'd make $28,381 and $22,204 per year, respectively, driving for the aerospace and grocery industries. Light truck drivers earned some of the highest hourly wages of $25.82 working for courier companies, according to the BLS, but only $10.19 with florist companies. A 20-hour workweek as a light truck courier driver would earn you $26,852 per year. But you'd only make $10,597 per year working 20 hours weekly delivering flowers. Light truck drivers earned some of the highest wages of $18.29 in Oregon, according to 2012 BLS data, and $15.59 in Michigan. If you worked 20 hours per week in Oregon or Michigan, you'd make $19,021 or $16,213 per year, respectively. Light truck drivers earned the highest wages of $24.65 in Alaska, and $19.10 per hour in Ohio. Working 20 hours weekly in Alaska or Ohio, you would gross $25,636 or $19,864 per year, respectively. You may find jobs more plentiful as a part-time heavy truck driver, as many people don't won't to spend time traveling and away from their families. The BLS projects a job increase of 21 percent for heavy and tractor-trailer truck drivers in the next decade, which is faster than the 14 percent growth-rate for all jobs. An improving economy and the need for timely deliveries will produce more jobs for heavy truck drivers. Jobs for light or delivery truck drivers will grow at an average rate of 15 percent. Light truck drivers have become more efficient using GPS systems, so fewer drivers are needed to make deliveries.